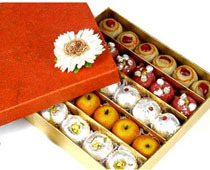 Assorted Premium kova Sweets and Kaju Sweets. 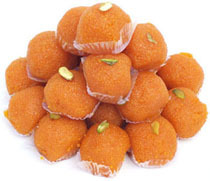 Tasty Motichur Laddu packed in gift pack, Weight : 1kg. 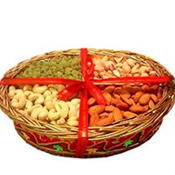 Dry Fruits in a Basket Gift your dear brother 400 Gms Dry Fruits decorated on a basket. 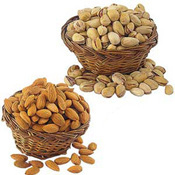 1/2 kg Badam 1/2 kg Pista . Very delicious and energetic. Healthy food for every one.. 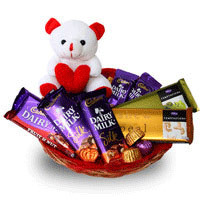 Basket of 5 Cadbury Assorted 65 gms silk chocolates with 2 temptations, 6 Inch teddy bear. 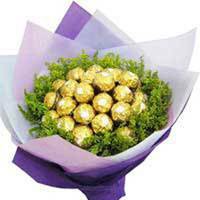 16 Pcs Ferrero Rocher chocolate bouquet will surprise anyone!. Bunch of 20 Mix Roses in Tissue Paper Wrapping Tied With Matching Bow. 10 Red Rose Red Packing Paper 5 Cadbury Chocolates of 13 grams each 1 Soft Toy. Charming bouquet of a 12 assorted roses. 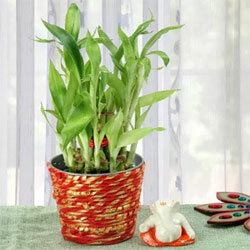 Your Gift Contains: 6 Purple Orchids Pink Packing Paper 2 Toblerone Chocolates of 50 grams each. 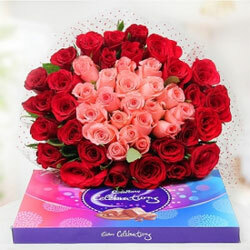 30 Red Roses forming the outer ring of bouquet and 20 Pink Roses cadbury celebrations pack of 118.4gms. .
Bring wisdom and happiness to your home with this beautiful Ganesha size 5"ins . 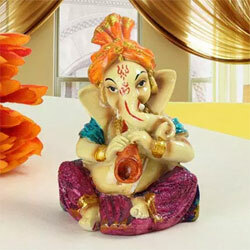 Two Layer Bamboo 5 Inches Ceramic Ganpati Idol 2x2 Inches. 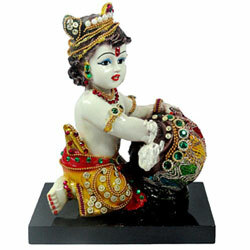 lead time 2 working days. 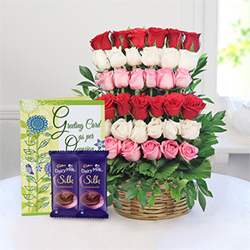 Mix Arrangement of 35 Roses with two bars of Cadbury Bars silk each one 60gms & Greeting Card. 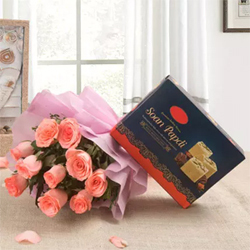 Give colorful surprise to your near and dear ones with this sweet gift hamper 10 Pink Roses Pink Packing Paper 500 grams Soan Papdi. 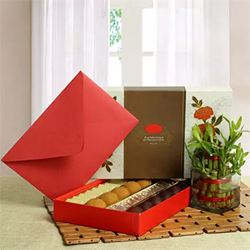 Assorted Kova sweets of 1 kilogram, two layer bamboo plant, and one greeting card are the ingredients of a great festive hamper. 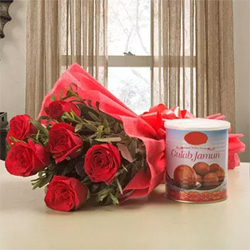 10 Red Rose Red Packing Paper 1 Kg Gulab Jamun for your loved ones and surprise them..
Kiwi Magic cake 1kg . Bored of regular flavours? 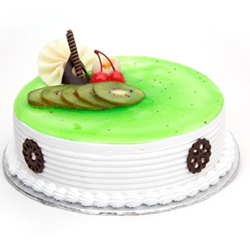 Try our premium kiwi flavoured cake with soft fresh cream and topped with adorable fruits. 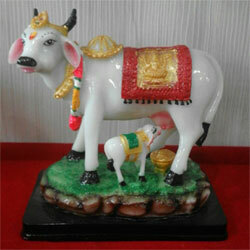 A silver statue of the cow with its calf.Gross Weight :33.70gm Base Metal:Silver 2 working days . You all know that red is the quintessential color of love but here we have wrapped some enticing red roses and mouth-watering chocolates in a red paper so that your day of love becomes a memorable one 6 Cadbury Dairy Milk Chocolate 12.5gm 6 Red Roses Red Paper Packaging Red Ribbon Seasonal Leaves. 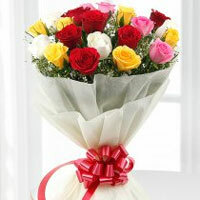 Bouquet of 10 Yellow Roses Ferrero Rocher Chocolate Box - 16 pcs..
Go to contact page ..